An initial Pediatric Study Plan (iPSP) is an outline of the paediatric study or studies that the drug development sponsor plans to conduct in the US to confirm the suitability of drug usage in the paediatric population. Initial Pediatric Study Plans cover study objectives and design, age groups, relevant endpoints and the statistical approach. 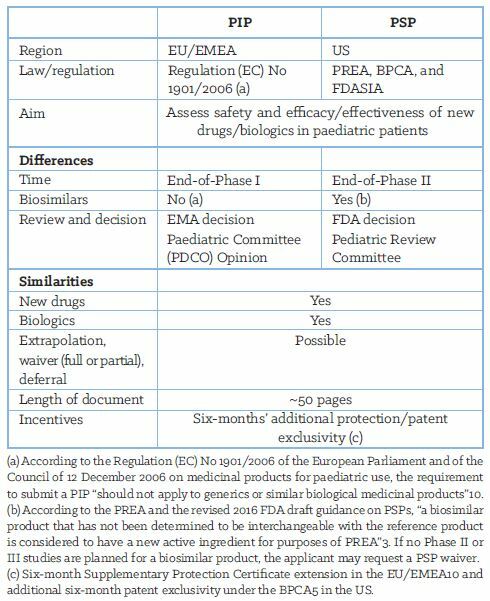 a comparative overview of the essential differences and similarities between PSP (required in the US) and Paediatric Investigation Plan (PIP [required in the EU]) requirements. Children make up approximately one-quarter of the world’s population, but despite this the majority of drugs used in children are usually prescribed ‘off-label’ and have not undergone rigorous testing within this population for safety and efficacy in well-controlled clinical trials. The historic lack of paediatric drug testing is due to a number of reasons including ethical issues, difficult trial design and recruitment issues, cost of paediatric studies, and lack of financial incentive for pharmaceutical companies. Another challenge is the diversity of the paediatric population; children of different ages (Table 1) have developmental (cognitive, physiological, and psychosocial) differences from adults, which make age- and developmental-related research of drugs important. Drugs that work in adults may not necessarily work in children, and simply reducing the adult dose to account for children’s reduced weight erroneously assumes proportional safety and efficacy. “Kids aren’t just little adults. Drugs approved for adults may not fit kids’ needs”. Compared with adults, children absorb and eliminate drugs from their bodies differently, can experience different side effects, and may require different drug formulations1. The development of regulatory guidelines and legal frameworks for undertaking studies in the paediatric population has been advancing since the 1970s, with the most significant impact being made in the last couple of decades (Figure 1). The Pediatric Research Equity Act (PREA) and the Best Pharmaceuticals for Children Act (BPCA) are two key highlights of this development. The goal of both PREA and BPCA is to provide paediatric information in drug labelling to encourage the appropriate use of drugs in treating paediatric patients. The 2003 PREA requested pharmaceutical companies to “assess the safety and effectiveness in pediatric patients”4 and to provide a mandatory iPSP whenever submitting a marketing application for a drug that includes a new indication, new active ingredient, new dosing form, new dosing regimen, or new route of administration (i.e. that is subject to the PREA). This applies to investigational new drug applications (INDs), new drug applications (NDAs), biologics license applications (BLAs), and efficacy supplements. The intent of the iPSP is for pharmaceutical companies to identify paediatric studies early in clinical development and begin planning for these Studies3. 2) to encourage the National Institute of Health (NIH) to prioritise therapeutic areas, sponsor clinical trials, and other research about on- and off-patent drug products that need further studies in children. Section IX. Reaching Agreement on the Non-Agreed iPSPs. requests for a deferral, partial waiver, or waiver, as well as other information specified in the regulations promulgated by the FDA. Pediatric Study Plans are often complex, strategic documents that combine current and legacy knowledge of a drug and its place in the armamentarium. Although regulatory affairs managers may be well versed in paediatric regulations, it is the medical writer (with handson experience in preparing iPSPs) who can guide a team through the practical complexities of information selection and adequate presentation. This is crucial from early planning and inception right through to submission to the FDA. A professional medical writer helps submission teams better interpret and implement not only the data, but also the requirements of the revised guidance. The writer can suggest the best way to provide the health authority with the data they need in a format and presentation that is both succinct and clear. 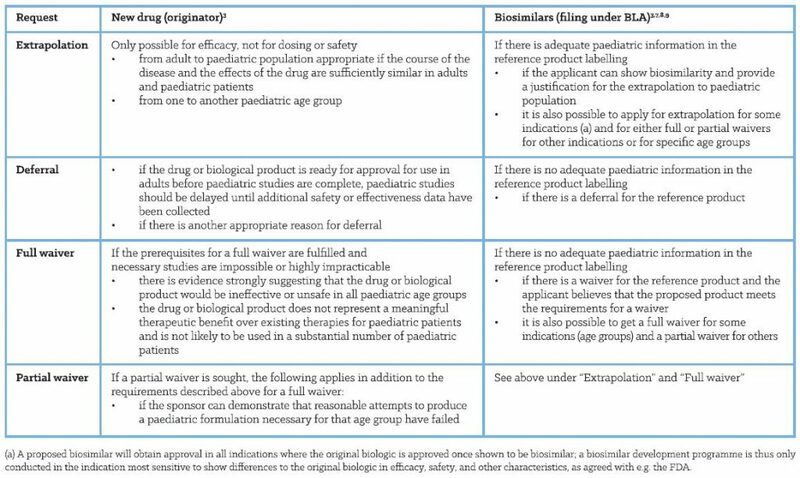 An overview of the updated template requirements and of proposed key contributors by section is provided in Table 2.
waiver, whereby the applicant proposes not to conduct paediatric studies; the waiver can be either full (no paediatric studies at all) or partial (no paediatric studies in certain paediatric age groups or certain indications)3. Further details about situations when each of these options is applicable are provided in Table 3. Once the initial iPSP has been submitted, the clock starts ticking, and pharmaceutical companies should be prepared to deal with very tight timelines. A professional medical writer can support a project team throughout this process, driving the document forward, aligning strategies and review comments, and helping teams to anticipate and prepare for potential questions that the FDA might provide. An overview of the required timing for submitting an iPSP is given in Table 4. Upon FDA feedback, an experienced medical writer can help to sculpt crisp key messages, free of ambiguity, to address any regulatory concerns. Additionally, the medical writer can make sure that the technical requirements of the new iPSP version are met in a timely manner. The steps from iPSP submission to iPSP agreement are presented in Table 5. An iPSP that fails to include the required information is deemed materially incomplete by FDA. If this applies, the FDA will contact the sponsor, who has 30 days to address insufficiencies. Thus, proper planning of timelines and resources is needed to ensure that all required functional roles are available to address any deficiencies that might be identified. Hence, it is of utmost importance that sponsors 1) have a clear understanding of the FDA requirements and their options of addressing the PREA before starting to plan for paediatric studies; and 2) plan ahead and refine their iPSP strategy well in advance of the EOP2 meeting. 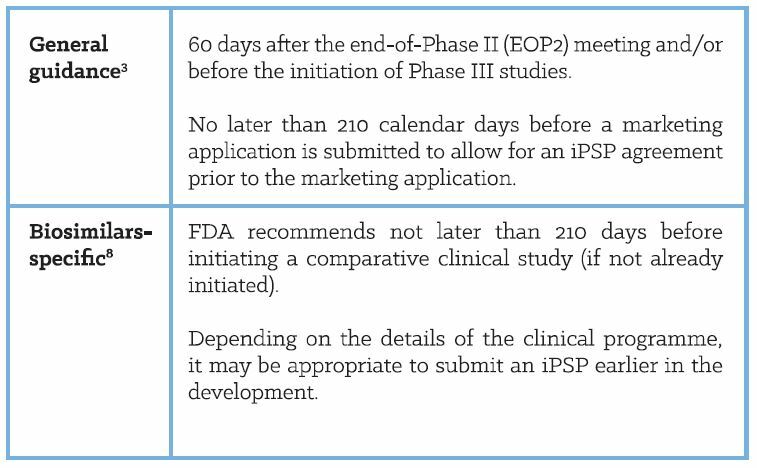 Once the sponsor submits an updated iPSP, a new 210-day review period starts3. changing a planned request for a (partial) waiver to planned requests for a deferral. The sponsor may amend an agreed iPSP at any time. However, if the aPSP is submitted within 210 days of a planned NDA/BLA submission or supplement, the amendment may not be considered to be agreed by the FDA, because the FDA will not have sufficient time to review it. The NDA/BLA or supplement can be submitted if the previously agreed iPSP is included in the submission package; in this case, any changes will be considered during the application review cycle. If the agreed iPSP included paediatric studies that the sponsor failed to complete, this will result in a failure to file3. While it may be tempting for authoring teams used to writing PIPs to think that PIPs10 and PSPs3 are quite similar in terms of content and procedural requirements, they also differ significantly. While both the PIP and PSP are generally mandatory documents for new drug applications, a number of differences must be considered in detail. See Table 6 for further information. 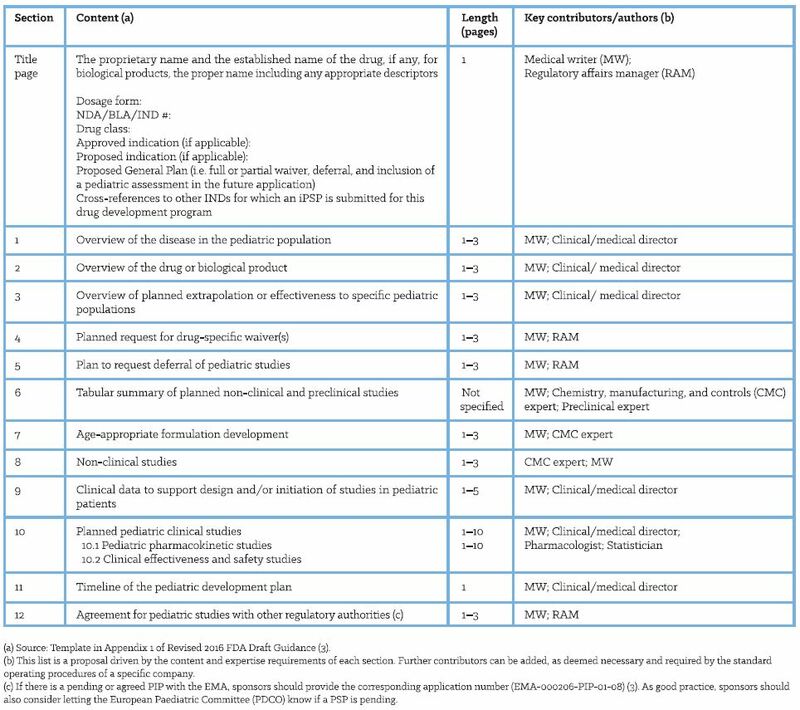 In summary, the intent of the PSP – as defined by the revised 2016 FDA draft guidance3 – is for pharmaceutical companies to identify paediatric studies early in the development and begin planning for these studies, in order to ensure increased effectiveness and safety in the paediatric population. An iPSP is an outline of the paediatric study or studies that the sponsor plans to conduct in the US – to confirm the suitability of drug usage in the paediatric population. Initial PSPs cover study objectives and design, age groups, relevant endpoints, and statistical approach. Amended PSPs are prepared, as necessary, after iPSPs have been produced. The revised 2016 FDA draft guidance and its updated template demand that sponsors follow a leaner and more targeted approach in developing their iPSPs. The preparation of a PSP requires concise presentation of information about the disease to be treated in children, as well as a description of all the relevant current knowledge of the drug being developed; placing this and the latest data into context and in doing so allowing a convincing rationale for the proposed PSP to be put forward. Medical writers can use their specialist knowledge in helping companies not only to understand the new template requirements, but also to deliver appropriate PSP messages in a concise, targeted, and timely manner, thereby contributing to a successful IND, NDA, BLA, or efficacy supplement submission in the US. www.nichd.nih.gov/sites/default/files/news/resources/links/infographics/Documents/NICHD_Pharma_Infograph.pdf, visited on 08 Jul 2018.
International Conference on Harmonization. Clinical Investigation of Medicinal Products in the Pediatric Population E11. Step 4 version; 20 July 2000. US Food and Drug Administration. Pediatric Study Plans: Content of and Process for Submitting Initial Pediatric Study Plans and Amended Initial Pediatric Study Plans Guidance for Industry. Draft Guidance. Revision 1; March 2016.
www.fda.gov/downloads/Drugs/DevelopmentApprovalProcess/SmallBusinessAssistance/UCM466469.pdf, visited on 08 Jul 2018.
https://bpca.nichd.nih.gov/Pages/default.aspx, visited on 8 Jul 2018.
https://blogs.fda.gov/fdavoice/index.php/2013/08/fda-takes-step-toencourage-pediatric-drug-studies/, visited on 16 Jul 2018. US Food and Drug Administration. Biosimilars: Questions and Answers Regarding Implementation of the Biologics Price Competition and Innovation Act of 2009 Guidance for Industry. April 2015. US Food and Drug Administration. Biosimilars: Additional Questions and Answers Regarding Implementation of the Biologics Price Competition and Innovation Act of 2009 Guidance for Industry. Draft Guidance. Revision 1; May 2015. US Food and Drug Administration. Guidance for Industry and Review Staff Pediatric Information Incorporated Into Human Prescription Drug and Biological Product Labeling. Draft Guidance. February 2013. Regulation (EC) No 1901/2006 of the European Parliament and of the Council of 12 December 2006 on medicinal products for paediatric use and amending Regulation (EEC) No 1768/92, Directive 2001/20/EC, Directive 2001/83/EC and Regulation (EC) No 726/2004. Official Journal of the European Union L 378/1.